BetFred are a UK bookmaker with an expertise in horse race betting. The BetFred app works on iOS, Android, Blackberry and Windows Phone handsets. Mobile wagers on racing from the United Kingdom, Australia, France and more. Quickbet options allows you to place a stake without having to go to the betslip. Get double the odds when you place your first wager. 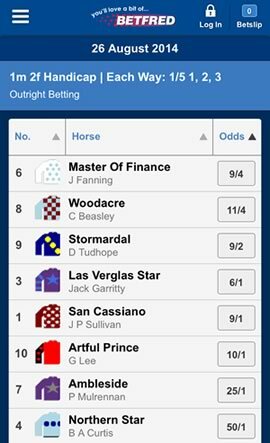 Competitive odds with wide variety of racing markets from UK, USA, Ireland etc. Betfred have been one of the biggest bookmakers in the UK for a number of years now. Their dominance first came about from the high street book shops, before eventually making the natural progression to the online world. What’s unique about the company is that they still take a lot of their custom from these high street stores, compared with other companies who have shut them down pretty much altogether. Their betting app is one of the latest products to come of their ever increasing production line and has been one of their most prominent features from the online betting section. The app is pretty much a carbon copy of their betting site, in terms of markets at least, and it’s integration with both smartphone and tablet devices make it a breeze to use. Horse racing is easily one of the most popular sports on the Betfred site. Throughout this review we will be looking at how well this has converted to their betting and more importantly, if this section is any good. Once you dive straight into the horse racing section on the app you are greeted with a long list of meetings that are taking place. These will range from around the world including the UK and Ireland, obviously, but also South Africa, France and other parts of Europe, depending on which events are taking place. Whilst the range of markets is certainly impressive, and the number of meetings is as comprehensive as you are going to get, there feels like there is very little order in this section. The meetings don’t have dates or times of races unless you click on them and some don’t even have races if you log in after the final race for that meeting has finished. There is no way to really know until you click on the link, which is frustrating to say the least. Once you find the market you are looking for – and actually has races running – you can then, finally, see a list of the races taking place and the time of that race. It should give you an overview of the type of race as well; so hurdle, flat, national hunt etc. This definitely makes the browsing a lot easier than on the previous screen. The card itself does its job, without ever really going to the extra mile. The first thing you are greeted with is the each way pay-out numbers, stating the fraction of the price and the number paid. The next section is a list of runners and the current odds. These odds are actually live odds so will change depending on the market moving. It seems like a simple feature, but you will be surprised to see how many bookmakers don’t actually update the odds until you get the price into your bet slip. The list also includes the jockey name under the horse’s name. Adding selections to your bet slip couldn’t be easier; simply click the horse you want and then it’s added for you. The great thing about this is that your bet slip never leaves your page so you don’t have to flick about if you want to make multiple selections. Unfortunately that’s where the features end for the app. There is a real lack of additional racing info from BetFred which we are surprised to see to say the least. Rather than offering a matched bet like every other online bookie, Betfred will instead double the odds on your first wager. That means if you place a winning stake on a horse at 10/1, BetFred will pay out 20/1. The racing section on Betfred does the basics really well. They offer a large amount of races from all over the world and this is something they should be proud of. It’s often hard to find a site that produces so many quality markets with competitive odds, so definitely kudos for this section. It lacks the addition of any racing form, horse information; even ground or going information would be good. Many apps link up to their news feed or Twitter feed now so punters can get the news straight from the race track. Betfred don’t operate this. It’s a shame really. We came into this review with high hopes for one of the most prestigious and oldest bookmakers not just in the UK, but the world. We can’t help but feel a little disappointed in all honesty as the app could have been so much better. Admittedly there is little ‘wrong’ with the app, what’s on their works well. It’s what’s not on there that’s the real problem, and to be honest, the list is quite significant. Fans of Betfred can certainly use this app, but punters who spend hours gloating over form and the information before making their pick, will have to look elsewhere for a more rounded horse racing app. Reviews bookmaker apps for horse races.